In 1998, the Administrative Council of the European Patent Organisation, seeking to update the European Patent Convention (EPC), agreed on a catalog of potential revisions (see "EPC 2000"). A Task Force was then formed to prepare detailed proposals for revision of the EPC, which were examined and refined in meetings of the Organisation's Committee on Patent Law. The Committee produced nearly one hundred changes to the EPC, which were collected in the Basic Proposal for the Revision of the EPC. The Administrative Council adopted the Basic Proposal in September of 2000, and submitted it to the Conference of the Contracting States, which adopted the changes as EPC 2000 two months later. 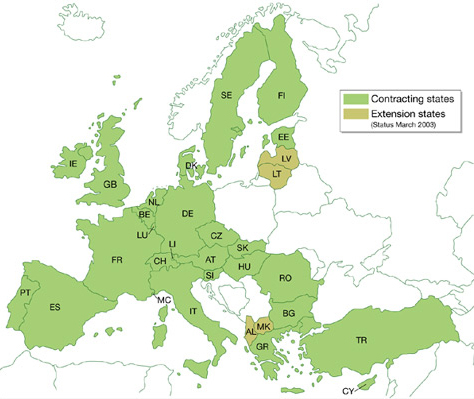 Following ratification of the EPC 2000 by Greece on December 13, 2005, the date by which the EPC 2000 would enter into force was set (see "Status of accession and ratification"). Thus, the EPC 2000 will take effect by December 13, 2007, at the latest. Many aspects of European patent law will be impacted by the EPC 2000, some significantly. The actual changes to all of the EPC Articles may be found here, while the completely revised articles (in German, English, and French) may be found here. Since there are so many changes, we are starting a multi-part series in which we will highlight – from a U.S. patent practitioner's perspective – some of the changes that will take effect. In the first installment of this series, we will discuss the changes to "use" claims. The use of a compound or pharmaceutically acceptable salt thereof as a medicament. Of course, other formats for first medical use claims are also perfectly acceptable. The use of X for the preparation of a medicament for the treatment of Y. (4) Paragraph 2 and 3 shall not exclude the patentability of any substance or composition, comprised in the state of the art, for use in a method referred to in Article 53(c), provided that its use for any such method is not comprised in the state of the art. (5) Paragraph 2 and 3 shall also not exclude the patentability of any substance or composition referred to in paragraph 4 for any specific use in any method referred to in Article 53(c), provided that such use is not comprised in the state of the art. It is now clear that second medical use claims are patentable. In light of these amendments, "Swiss" claims are being phased out as redundant, and therefore, unnecessary. Of course, first medical use claims are still patentable. 10. The use of a compound or pharmaceutically acceptable salt of claim 1 as a medicament. 11. The use according to claim 10, wherein the medicament is suitable for use in treating condition Y or is suitable for use in patients who are at risk of developing condition Y. (The claim numbers are chosen at random.) As a result of these changes in the EPC, the use of "Swiss" claims can be expected to cease, not because they are not valid but because they are no longer necessary. Mr. Crawford is a registered patent attorney at the law firm of McDonnell Boehnen Hulbert & Berghoff LLP, where he focuses on chemical and pharmaceutical patent preparation and prosecution. He has a master's degree in organic chemistry from the University of Illinois, has worked as a bench chemist in the pharmaceutical industry, and is a named inventor on three U.S. Patents. As noted here, Mr. Crawford will be giving a presentation on "International patent protection and strategy" at the American Chemical Society Spring 2007 meeting in Chicago, IL on March 28th. Additional Disclaimer: This article, like all articles on Patent Docs, is intended for informational purposes only, and does not contain any legal advice whatsoever. Moreover, Mr. Crawford is not a European patent attorney. Readers having questions about the impact of the EPC 2000, therefore, should seek the advice of European patent counsel. "10. The use of a compound or pharmaceutically acceptable salt of claim 1 as a medicament. 11. The use according to claim 10, wherein the medicament is suitable for use in treating condition Y or is suitable for use in patients who are at risk of developing condition Y." are allowable under Art. 54(4) and 54(5) EPC2000 is wrong. "Product X for use as a medicament" or "Product X for use in medicine" or "Product X as an analgesic". He is nevertheless correct when writing that "Swiss type" claims of the type "Use of product X for the manufacture of a medicament for treating disease Y" will still be allowable. Thank you for you comments regarding my post. I will address your comments in the order that they were presented. First, you disagree with the proposed claim format I suggested. As a preliminary matter, this format was based on communications with one of our European associates. As I stated in my article, "One way to draft first and second medical use claims is:" This language clearly indicates that there are many possible ways to claim first and second medical uses. Second, you say that my proposed format is "wrong" and not "allowable under Art. 54(4) and 54(5) EPC2000." After receiving your comments, I re-reviewed these articles, and I cannot find any support for such an assertion in these articles. For brevity's sake, I have not repproduced the articles here. However, I do not want to discount the possibility that you are aware of some case law that I am not. If so, I would appreciate hearing more about it. Your third comment is directed towards the format of first medical use claims. I wrote that first medical use claims may be written as "The use of a compound or pharmaceutically acceptable salt thereof as a medicament." I also stated "Of course, other formats for first medical use claims are also perfectly acceptable." One of the formats that you seem to prefer is "Product X for use as a medicament." In the past, I have used this format as well. I have also seen or used the following, which (along with the format you suggest) may be found in the Examination Guidelines for Patent Applications relating to Medical Inventions in the UK Intellectual Property Office June 2007: i) (Substance X) for use in the treatment of (medical condition Y); ii) (Substance X) for use as a (Y-treating agent); and iii) As a (Y treating agent), the (substance X). As the old saying goes, there is more than one way to skin a cat. After reviewing my post, I see that my suggested format for first medical use claims contains a typographical error, because I omitted the variable "X." Inserting the "X" into my first medical use claim affords the following "The use of a compound X or pharmaceutically acceptable salt thereof as a medicament." I do not see a big difference between your suggested format and my (revised) format. I note that mine also expressly covers a "pharmaceutically acceptable salt" of the compound. In your fourth comment, you disagreed with the format I suggested for the second medical use claim. More specifically, you stated "Further medical uses of known compounds used in medicine will have to be drafted under the format "Product X for use in the treatment of disease Y" to meet the requirements of Art. 54(5) and 53(c) EPC2000." I believe that your suggested claim format would be accepted by the EPO but I think mine would be as well. Again, I do not understand Art. 54(5) or 53(c) EPC 2000 to require a particular claim format be used or the use of a particular wording, nor do I believe that there is only one way to draft a claim. Finally, at least we agree that "Swiss" claims are not invalid. Thank you for reading my article and for taking the time to submit a comment regarding it.